For centuries, Icelandic food was rather bland. But thanks to a growing global consciousness and geothermal greenhouses, it’s blossomed from its humble beginnings into an exciting, varied and cosmopolitan cuisine. And yet, while many restaurants in Reykjavik look abroad for gastronomic inspiration, the food scene around Lake Mývatn finds it much closer to home. Like everywhere else in the world, Iceland’s food reflects its culture. When the Norse settlement of Iceland began at the beginning of the 9th century, settlers met a fierce and formidable land. An island on the cusp of the Arctic Circle, its extraordinary nature, harsh conditions and remoteness forced the new arrivals to make adjustments necessary for their survival. These adjustments led to compromises that brought, at times, unexpected benefits, and their relationship with the volcanic character of their new home evolved into one displaying co-operation and harmony. Nowhere is this more visibly captured in Icelandic cuisine than by Lake Mývatn. There are no bakeries in Lake Mývatn, at least, not the ones you’re used to. Like in many other parts of Iceland, locals have been baking bread underground by harnessing the volcanic steam billowing out of the earth for centuries. The bread baked in Mývatn’s geothermal bakery—mostly a collection of holes dug a half meter into the ground and covered with wood, bricks and stones—is called hverabrau› (geysir bread) to differentiate it from the oven-baked rye bread (rúgbrau›) that’s devoured throughout Iceland. Geysir bread recipes are handed down through the generations, and every family has their unique twist on the recipe. But, at its core, geysir bread is made from rye, flour, sugar, salt, yeast and water. These ingredients are mixed, placed in a milk carton, and then left to bake underground for 24 hours. This volcanically-baked bread tastes sweeter than regular bread and, according to locals, tastes even better layered with salted butter and a slice of smoked Arctic char. The underground bakery is strictly off-limits to tourists, but that’s okay because there are tons of places around town that serve it. The concept behind the Vogafjós “Cowshed Restaurant” is unique. Take a working farm that’s been in the same family for nearly 130 years and turn it into a farm resort with log cabin accommodation and an excellent farm-to-table restaurant. Then fit a window into one side of the restaurant that look’s straight into an actual cowshed, so diners can literally see where their food comes from. “We believe that you are what you eat, so it’s very important to know where your food comes from. We produce most of our meat on the farm—lamb and beef. We also make cheese here, using our own milk,” explains Ólöf Hallgrímsdóttir at Vogafjós. Vogafjós’s menu is proudly local. 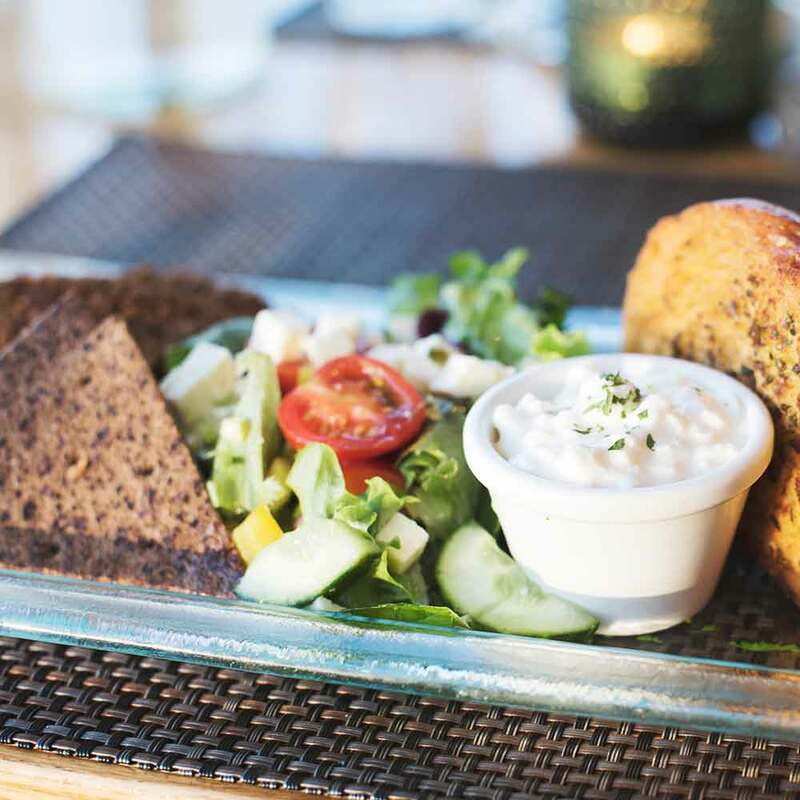 Mains include pan-fried Arctic char served with warm potato cake, fresh salad, and their unique Mývatn salad cheese. There’s the Vogafjós beef burger served with homemade bread, onion, tomatoes, and Mývatn mozzarella, and then there’s Vogafjós raw smoked lamb (smoked the traditional way with sheep and cow dung) served with cottage cheese, blueberry jam, and their geothermally-baked geysir bread—based on a recipe that’s been in the family for many generations. Vogafjós is also a member of Vakinn, the official quality and environmental system for Icelandic tourism. The operational and environmental standards set by Vakinn are very high, so it’s a pretty big deal to be endorsed by them. Time your visit to the restaurant at 7:30 in the morning or at 17:30 in the afternoon, and you’ll be able to see the cows milked and even taste the fresh, warm milk direct from the cows. Time your visit to the farm in May, and you may be able to see some newborn lambs. Fish is an essential part of the Icelandic diet. It’s so fundamental that Icelanders eat four times as much fish than any other developed nation. But in Lake Mývatn, fish isn’t just a staple of the local cuisine—it grew into an industry that became part of its cultural fabric, and, up until the last 15 to 20 years, was vital to the local economy. These days, however, limits on commercial fishing to help re-stock the lake have restricted fishing to just 14 days each summer. Even still, locals can fish the lake year-round, which greatly supplements the area’s agricultural production. Like most restaurants in Lake Mývatn, Eldey Restaurant uses only fresh, locally-sourced ingredients in its gastronomic creations to reflect the uniqueness of the area. Produce is sourced from the geothermally-heated greenhouses in Hveravellir and Vallarnes, famous in Iceland for their organic fruit and vegetables; while the Arctic char comes from Húsavík, the whale watching capital of Iceland. The otherworldly topography of pseudo craters, rugged mountains and lava fields outside the windows of the fab restaurant inside Lake Mývatn’s Hotel Laxá are compelling enough reasons to dine here. And yet still, the exceptional regionally-inspired menu featuring all the local specialties refuses to be outshone by the surrounding landscape—especially when you order the lamb. Brought in from nearby farms in northern Iceland and served with beetroot and apple-purée potatoes, fondant, portobello mushrooms and caramelized onion sauce, Eldey’s signature lamb fillet exemplifies this commitment to high-quality ingredients. About Icelandic lamb: it’s unique. For starters, they’re much smaller and have shorter legs than European lambs, and come in many different colors: white, brown, black, grey, even reddish brown. The meat is a lot darker too, and has a more gamey flavor—its taste has been compared to venison. But more importantly, unlike their northern European cousins, developed for food production for hundreds of years, Icelandic lambs are direct descendants of those first sheep brought over by sea over many centuries ago. They’re authentic Viking lamb, genetically unchanged, and an important staple of the Icelandic diet that’s endured for over a millennium. And thanks to the regional commitment to stay true to their roots, restaurants in Lake Mývatn are helping to ensure that Icelandic lamb and other traditional foods and cooking methods endure for future generations to come.